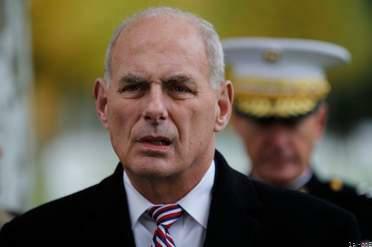 President Donald Trump of the United States of America says chief of staff John Kelly will leave his job at end of year. John Kelly, who joined the White House as chief of staff in July 2017 after the departure of predecessor Reince Priebus, spent months fighting to establish and maintain control of a White House marked by competing factions and complicated by a president who thrives on keeping everyone guessing. Kelly's departure comes at a pivotal time for Trump's administration, as special counsel Robert Mueller's investigation continues to hand down legal developments concerning people close to the president, and as Democrats prepare to take control of the House -- and the investigative powers that come with it -- in January. President Donald Trump, announced Saturday that John Kelly will be leaving his post as White House chief of staff at the end of the year, marking the end of a tenuous, sometimes tumultuous tenure that many believed would conclude months ago. "John Kelly will be leaving, I don't know if I can say retiring but, he's a great guy," the president told reporters. "John Kelly will be leaving at the end of the year. We'll be announcing who will be taking John's place, it might be on an interim basis. I'll be announcing that over the net day or two." The president added, "I appreciate his service very much." It is unclear who will replace Kelly, although Vice President Mike Pence's chief of staff, Nick Ayers, has been lifted as a possible successor.